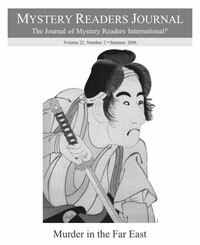 The next issue of Mystery Readers Journal (Volume 34:3) will focus on mysteries that take place in the Far East. We're looking for Reviews, Articles, and Author! Author! essays. Author! Author! essays: 500-1500 words. Author essays are first person, about yourself, your books, and the 'Far East' connection. Think of it as chatting with friends and other writers in the bar or cafe about your work and your Asian/Far East connection. Add title and 2-3 sentence bio/tagline. Please forward this request to anyone you think should be included.